The restoration of early keyboard instruments has gradually become a major emphasis of the business, serving professional musicians, the trade sector, collectors and owners of single instruments in addition to restoring our own instruments for sale. 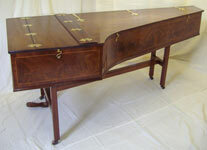 We are experienced in the restoration of Spinets, Harpsichords, Clavichords, Square Pianos and early Grand Pianos. Every instrument that passes through the workshop is very much an individual item requiring its own level of restoration. It is our philosophy to retain as much original material as possible whilst returning the instrument to a playable condition. Where we have to replace components, such as strings, we take care to use materials appropriate to the period of the instrument. We are well aware that there are differing opinions regarding the merits of various aspects of the restoration process, so full consultation with each client is an important aspect. All work is documented in a written report together with a photographic record of every restoration. We also offer a comprehensive tuning and maintenance service for antique and more modern instruments. Whilst we are based in the south-east of England we travel extensively for work, with clients all over the UK from Scotland to Cornwall, in Ireland and mainland Europe.